The Wedge-It: Your only cargo stabilizer, cargo organizer, & auto/truck organizer. This product is temporarily suspended. We are looking for a partner or a purchase of this patented item. If you have any interest, please inquire via this site. The first truly versatile, portable, multifunctional cargo stabilizer available. It will hold firm the groceries in your trunk, the cooler in your boat and the tool chest in your pick-up or utility vehicle. Just place your cargo into a secure corner of your trunk, your boat, your SUV, RV or your truck. Then position any corner of the Wedge-it under an opposing corner of your cargo. The “Patent Pending” design of the Wedge-it will do the rest! Wedge-it will hold firm your groceries, tool chest, sales literature, cooler or any other items you need to transport securely in place as you take corners, hit speed bumps, or ride the waves. The more weight that you put on the top portion of the base of the Wedge-it (within reason), the more lateral resistance you create. Whether it is a three pound bag of groceries or a hefty tool box, the Wedge-it will hold it firm. 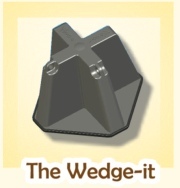 The "patent pending" design of the Wedge-it is the first of it's kind -- versatile, portable, and multifunctional. 2006-2007© Wedge-it. All rights reserved.